Rug hooking has a long history in Canada. Pioneers recycled the fabric from old clothes, cut them into strips and hooked them into burlap sacks to create rugs to keep them warm during the winter. 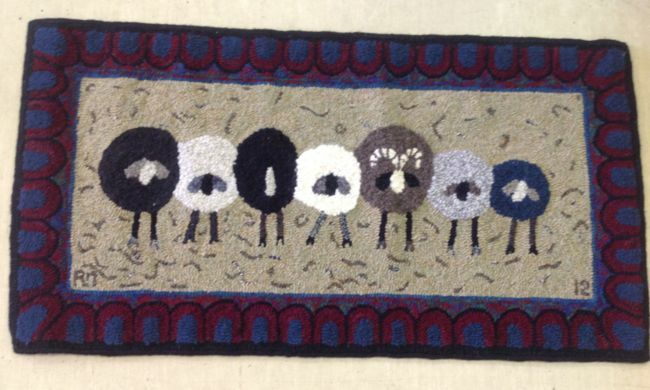 Today, rug hooking is a creative handicraft art that uses woollen and speciality fabrics that are cut into strips with a special machine and stitched into wall hangings, cushions and floor mats. Getting started in rug hooking is easy and requires only a few tools such as: hoop, fabric hooks, scissors, burlap (or other fabric) and fabric. This is a suitable craft for all ages and abilities. To discover more about this discipline, visit us in person! We meet every Wednesday between 9:00 a.m. and 2:00 p.m. at the Rosscarrock Community Hall (4411 10 Avenue S.W.). NOTE: Meeting times in July and August are 9:00 a.m. to 12 noon.